Even young children can learn the basics of golf. Parents often introduce their kids to golf by teaching them the basics of the game. Kids can’t wait to learn because they view golf as a grownup activity they can do with mom and dad. Teaching your children how to play can be a great bonding experience provided you have a lot of patience—recall how difficult it was for you to learn the game—so provide plenty of encouragement. If you find teaching golf to be too difficult, have your child take lessons from a PGA professional who enjoys working with junior golfers. Gripping a golf club for the first time feels strange for adults, but even more so for children because their hands are smaller. It is important a child learns the fundamentals of a good grip. Show him how to place his left hand on the club first, then the right. The thumb and forefinger of each hand form a “V” shape. Have him grip the club so the Vs point slightly right of center. Both the overlapping grip—with the little finger of the right hand placed in the space between the left forefinger and middle finger—and the interlocking grip, with the little finger of the right hand linked together with the left forefinger—can be used by children. Kids have a tendency to stand straight when they address the ball, with the club too close to their body. The correct posture is to bend forward and slightly flex your knees. Children need to be taught the relationship among body alignment, club alignment and where the ball goes. Place a club on the ground and aim it toward the target. Have the child place her feet up against the club and then square her hips to the target line. Stand behind her and help her line up the clubface toward the target. With the next shot, let her try to line up the club herself. Kids often think if they swing hard enough they will hit the ball as far as adults. The goal when they are first learning the game should be positive reinforcement from making solid contact with the ball. Their first swings should be half or three-quarter swings that allow them to maintain their balance. Kids tend to rush the swing. With your own club, demonstrate the one-piece takeaway, in which you slowly extend your arms as you go back. Give the child the feel for the backswing by standing behind her and grasping her club with your right hand on the shaft and then pulling the club slowly back. It’s difficult for a child to keep her head still throughout the swing. Your child may need to be reminded of that swing fundamental often in the beginning. Just like many adults, she too will be eager to see the result of her shot and lift her head too soon. 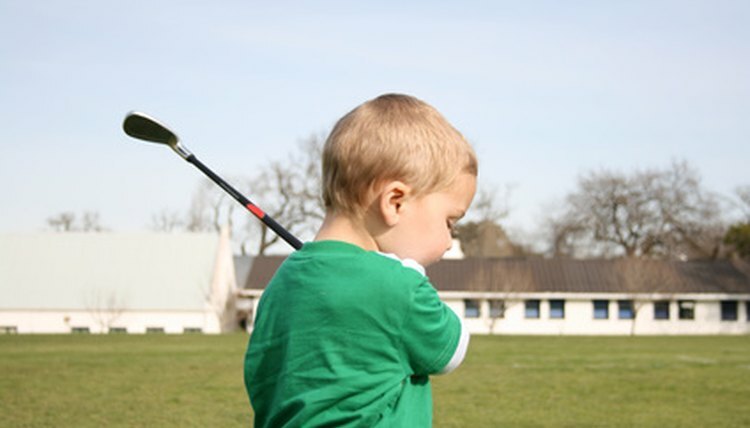 Kids can begin to learn golf etiquette the first day they pick up a club. Start with simple rules like not talking while other golfers are playing their shot. Even though kids may get excited when they hit a good shot, they should learn not to yell or scream. Another basic etiquette lesson kids should learn is to walk, not run, across the putting green. While your child is learning swing fundamentals and etiquette, don’t forget to emphasize one other important golf basic: have fun!